Rule templates are used to provide a simple way of creating one or more rewrite rules for a certain scenario. URL Rewrite Module 2 includes several rule templates for some common usage scenarios. In addition to that URL Rewrite Module UI provides a framework for plugging in custom rule templates. This walkthrough will guide you through how to use "Reverse Proxy" rule template that is included with URL rewrite module. 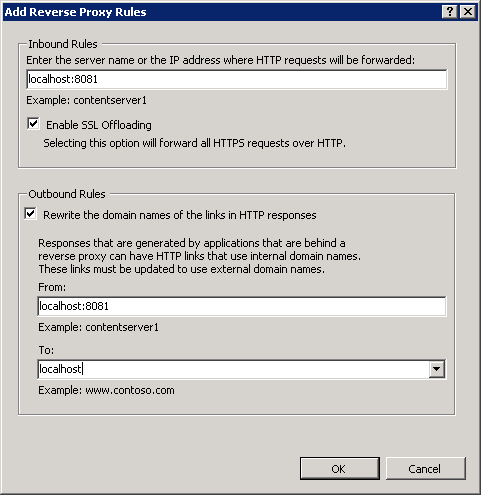 To learn more about configuring reverse proxy with IIS URL Rewrite Module and IIS Application Request Routing refer to Reverse Proxy with URL Rewrite v2 and Application Request Routing. 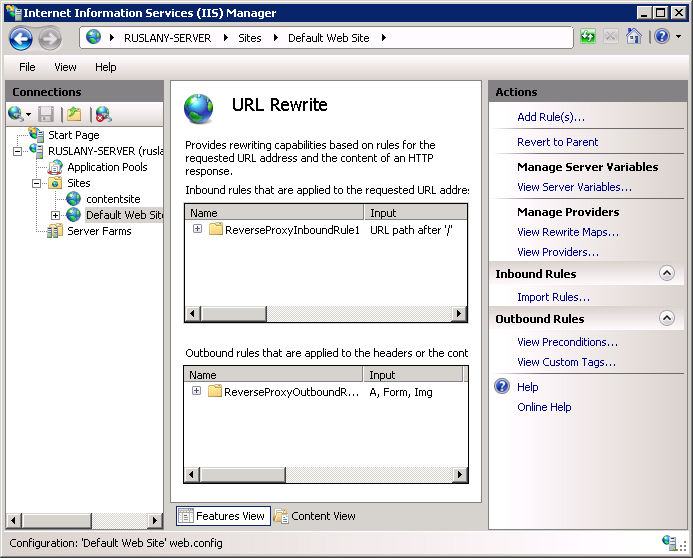 IIS Application Request Routing installed. For simplicity, the reverse-proxy scenario you will work with in this walkthrough will be implemented on a single server, with the IIS "Default Web Site" acting as a reverse-proxy site and content application hosted in separate IIS web sites on the same server. Create an IIS web site called "contentsite" that point to the corresponding folder under %SystemDrive%\inetpub\. Use port 8081 for the site. The "Reverse Proxy" rule template can be used to generate inbound rewrite rule that is used to proxy the HTTP requests to another server. Optionally the template can also create an outbound rewrite rule that can fix the host names in the links URLs inside of HTML responses. In the example case described in this walkthrough the proxy server host name is localhost and the content server's host name is localhost:8081. The web application on the content server generates a link in HTML response that uses an internal host name, e.g. http://localhost:8081/default.aspx. The outbound rule fixes this link to use the proxy's host name, e.g. http://localhost/default.aspx. In the IIS Manager select the "Default Web Site" in the tree view on left hand side. Open the URL Rewrite feature view. 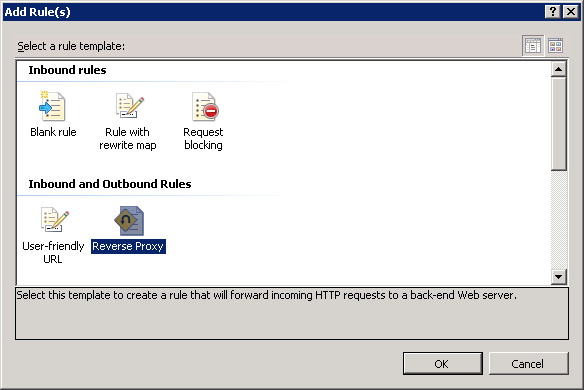 In this walkthrough you have learned how to use "Reverse Proxy" rule template to generate rewrite rules to implement a simple reverse proxy configuration in IIS. This rule template can be used as a starting point to generate the base rules which can be adjusted or modified later to address the specific routing and rewriting requirements that you have for your web application.